The extra high side walls and top entry of this Big Box Cat Litter Tray make it ideal for cats that stand when urinating or that like to scratch up their litter. Litter, urine and stool will all remain inside the box, away from other two-legged and four-legged members of the household! The spacious size makes it ideal for large breed cats and there is even enough space for it to comfortably be the sole litter box for a multi-cat household. The clever construction of the roof of the Big Box Cat Litter Tray offers a large top entry behind a 13cm-high back wall. This ensures that your cat has to walk over the surface containing small holes whenever it leaves the litter tray, ensuring that any litter attached to its paws fall back in rather than entering your home. 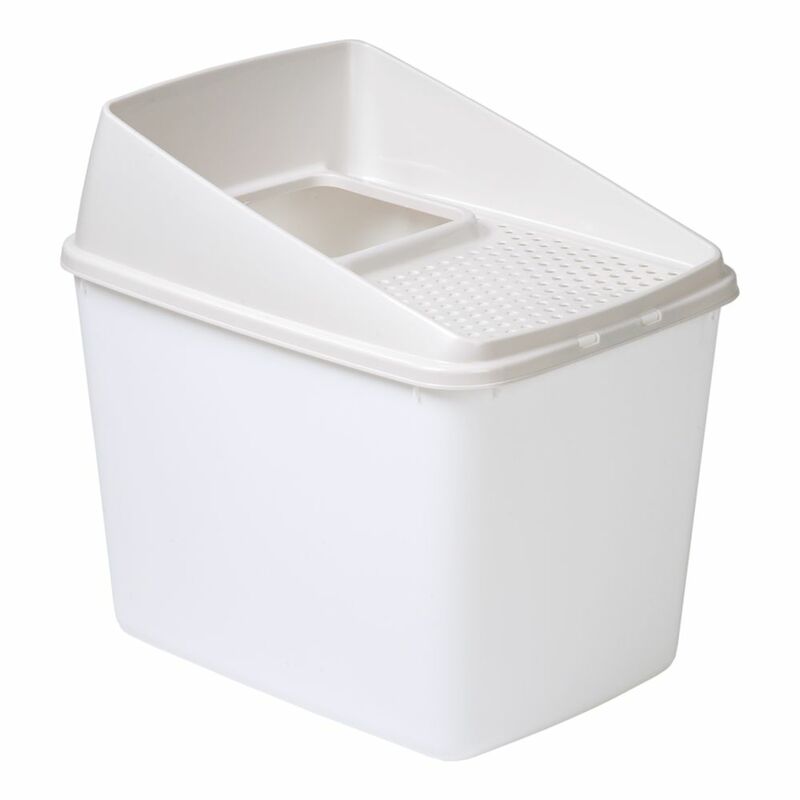 The Big Box Cat Litter Tray also has practical clips that allow you to remove the roof of the litter box for cleaning. The tray inside has a smooth surface with no ridges or gaps, to ensure that no urine or faeces can become trapped and helping to keep the Big Box Cat Litter Tray clean and hygienic. Big Box Cat Litter Tray at a glance: Spacious top-entry cat litter box Ideal for large breed cats, multi-cat households, cats that urinate standing up and those that like to flick their litter around High side walls: helps to keep urine and faeces far away from other members of the household Clever lid design: with a large opening and 13cm high back wall, with holes through which any litter stuck to your cat's paws can fall back into the box Removable lid: for easier cleaning and with practical clips to secure it Smooth inside: no grooves or gaps to ensure optimum hygiene Colour: Base tray: white Lid: cream Material: plastic Dimensions: Total: 52 x 40 x 51 cm (L x W x H) Inner: 50. 5 x 37 x 37 cm (L x W x H) Entrance: approx. 19 x 18.5 cm (L x W) Entry height: 39.5cm Holes in lid: approx. diameter 8mm.